Nrityagriha School of Indian Classical Dance presented its senior most student, Shruti’s arungetram, much to the pride of her parents and friends on the 12 July 2014 at the Abbotsleigh Girls High School. It was a cold winter evening but the warmth that Shruti generated with her speedy, expressive and entertaining dance kept many sitting in awe in their seats in this large auditorium. 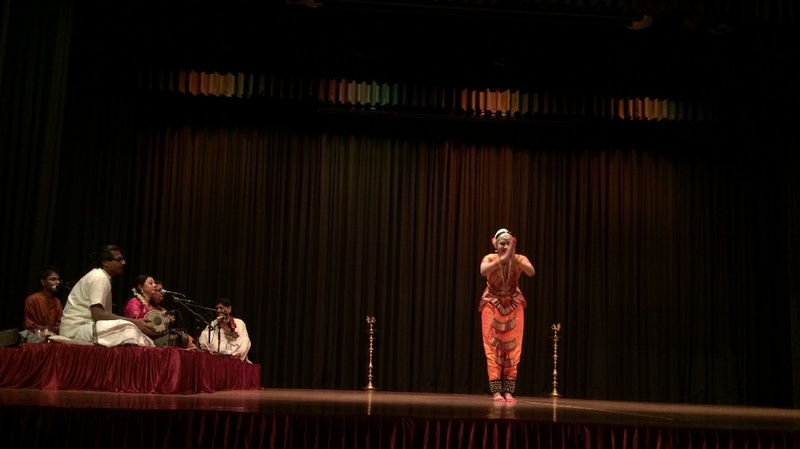 She commenced her performance in the traditional style of presentation with the Thodaya Managalam. The enriching voice of Prema Ananthakrishnan hit the ears and feet of the dancer as she danced in tune in praise of Lord Vishnu. Set in a ragamalika, Jaya Janaki was a captivating start to the evening. This was followed by the Jathiswaram that kept the interest of the audience going. The main piece of the arungetram representing Shakthi comprised of ‘Mathe Malaya Dwaja’ an ancient traditional composition of Harikesanallur Muthiah Bhagavathar it formed the varnam or the central main part of the Arungetram. The nattuvangam by Guru Padma BALAKUMAR added oomph and pizzazz intercepted with a short portrayal in the middle with a furious Mahishasura Mardhini. Padma Balakumar’s choreography was brought to life with force and strength by Shruti with great appreciation by the audience whose resounding claps are still ringing in the author’s ears. The difference between a good choreography and a great one is that the latter stays with you long afterwards. Kudos to Padma BALAKUMAR for her excellent choreography weaving the sloka ‘Mahishasura Mardhini’ into the varnam. With amazing expressions, fast and light footed, Shruti successfully proved that where there is a will there is a way in showing confidence, command and control in the execution of her varnam. The rest of the program consisted of pieces that were rich in Bhavam, yet rhythmic to keep the interest of the audience. Natanam Aadinaar another favourite of Gopalakrishna Bharathi brought Shiva’s thandavam to life. This was followed by the Rusli Radha where Venkatesh on the flute added effects of the calls of the birds, describing the nature of bees, birds, the flowering gardens and spring, Balaji’s violin and Pavallan on the Mridangam brought to life the story of Radha and Krishna. Shruti concluded her arungetram with a Kavadi Chindhe, Tumaka Chalatha and a Thillana of Balamurali Krishna. An Arungetram is not just about giving one performance but the journey that leads to it and the experience gained on its way, bringing the dedication of many hours of dance to a level that it now becomes a presentable beautiful artform. Kudos to Shruti, her family and her guru.